NORTH SHORE & CBD LOCATIONS. BOOK NOW. BOOK A CONSULTATION WITH SPECIALIST ORTHODONTIST DR VANDANA KATYAL. Sydney orthodontist, Dr. Vandana Katyal, straightens teeth to absolute perfection and leads CCC Smiles (Clean, Clear & Correct) in the heart of Mosman, North Shore. Invisalign and clear aligner treatments are the expertise of Dr. Katyal, one of the best, highly-respected and sought-after certified Sydney CBD specialist orthodontist. An internationally- acclaimed top orthodontics clinician, researcher and lecturer, Dr. Katyal had a vision to create perfect, healthy smiles all across Australia and since the inception of CCC Smiles, that’s exactly what she’s achieved. If you are looking for an Orthodontist near me look no further than Dr. Katyal. At Clean, Clear & Correct Smiles, we provide personal and attentive care in a luxurious, state-of-the-art and boutique CBD environment. Dr. Katyal and her staff are committed to creating a welcoming, friendly and informative setting. With top expertise that’s among the best in Sydney, Invisalign braces patients at CCC Smiles can count on reliable service, access to honest information and best results. We use only the best and latest in digital equipment and innovations in the field of invisible, accelerated and digital orthodontics. Based in the beautiful setting of Mosman, North Shore, we are the perfect option for customers looking for an ‘orthodontist near me’. Invisalign braces are growing in popularity, locals in Sydney’s Northern Beaches live a highly coveted lifestyle and it’s one that they don’t want to compromise during their orthodontic treatment. Invisalign in Sydney is the ideal solution, because patients can continue to eat their favourite food, play their loved sports and socialise without the insecurities that often come with traditional wire braces. There’s a reason for the popularity surge in Invisalign braces, Sydney locals and individuals across the country are choosing CCC Smiles to take care of the entire teeth straightening and correcting process. We provide Invisalign for teens because of its many advantages over traditional braces and Invisalign for adults that prefer an almost invisible orthodontic treatment. Our local North Shore parents often walk out smiling and thankful for how our orthodontist Dr Katyal and the top CCC Smiles team deliver orthodontic treatments in such comfort for their children and teens. Our experts are on-hand to explain your treatment to you in detail, including information about time frame estimations, cost and any ongoing adjustments. We treat even complex cases such as overbites, unerupted or impacted teeth, severe crowdings and narrow smiles. We strive to make everyone that comes through the CCC Smiles door feel welcome, so feel free to ask us any questions you may have. Contact our orthodontic practice to schedule your initial consultation with one of Australia’s leading and highly experienced specialist orthodontists, Dr. Katyal to begin your smile transformation journey with Invisalign in Sydney. Do private health funds help get the smile you want? 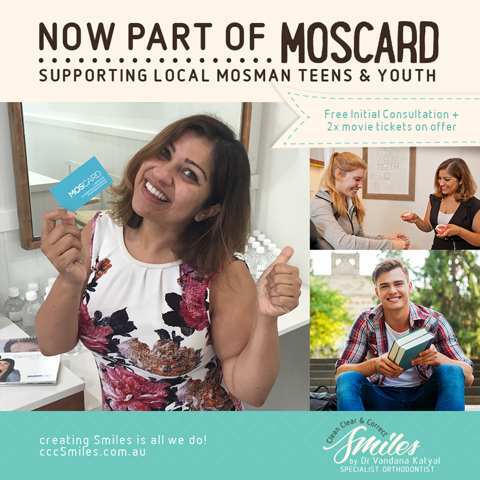 Special Offer available to Mosman Youth Moscard Holders. Want a clean clear & correct smile? We offer the very latest in digital orthodontic treatments.